The Highland breed has lived for centuries in the rugged remote Scottish Highlands. The extremely harsh conditions created a process of natural selection, where only the fittest and most adaptable animals survived to carry on the breed. Originally there were two distinct classes: the slightly smaller and usually black Kyloe, whose primary domain was the islands off the west coast of northern Scotland; the other, a larger animal generally reddish in color, whose territory was the remote Highlands of Scotland. Today both of these strains are regarded as one breed - the Highland. In addition to the original strains, yellow, dun, white, brindle and silver are also considered traditional colors. The first Highland herd book was established in 1884. Around that time, American cattlemen from the western U.S. recognized the natural qualities of the Highland animal and imported them to improve the blood lines of their herds. As a result, the Highland contributed in a great way to the success of the American cattle industry. Today Highlands are found throughout North America, as well as in Europe, Australia and South America. Highlands require little in the way of shelter, feed supplements or expensive grains to achieve and maintain good condition. In fact, cold weather and snow have little effect on them. They have been raised as far north as Alaska and the Scandinavian countries. They also adapt well to the more southerly climates with successful herds as far south as Texas and Georgia. Less than ideal pasture or range land is another reason to consider the Highland breed. These cattle are excellent browsers, able to clear a brush lot with speed and efficiency. The Highland is a disease resistant breed. Long lashed and forelocks shield their eyes from flying insects and as a result, pinkeye and cancer eye are uncommon. They do not stress easily, so stress-related diseased occur with less frequency. 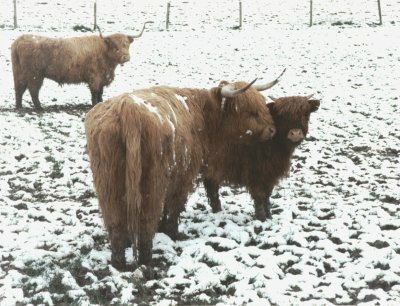 Other bovine diseases affect the Highland less, due to the genetic advantages they have achieved. Despite long horns and an unusual appearance, the Highland is considered an even-tempered animals, bulls as well as cows. They can be halter trained as easily as any other breed. The business end of any beef animal is the amount and quality of the beef it produces. Todays market is demanding lean, premium meat. The Highland carcass is ideally suited to meet this challenge. Highland beef is meat that is lean, well marbled and flavorful with little outside waste fat (their insulated by long hair rather than a thick layer of fat). For over 20 years, Highland and Highland crosses have graded in the top of their respective classes at the prestigious National Western Stock Show in Denver, Colorado. In the British Isles, Highland beef is recognized as the finest available and fetches premium prices. The British Royal family keeps a large herd of Highlands at Balmoral Castle, near Braemar, Scotland and considers them their beef animal of choice. to produce a fine cut of beef with as little effort and expense as possible. Highlands are the breed to help you do this. Whether your interest is in purebreds or cross breeding, we are confident that the Highland will improve your bottom line. Highlands are an old breed whose time has come. With the ability to thrive in less than ideal circumstances, outstanding mothering instincts, longevity, very low calf mortality and disease resistance, they have the ability to produce the type of beef that is in demand for todays market.